This past weekend went by very quickly. On Friday morning, our sick student Nate flew home with his mom and sister. They made it home in the greater Chicago area safely. Please continue to keep Nate and his family in your prayers. On Friday morning our group left at 5:30am to head off to our Heidelberg | Koblenz | Köln weekend. We arrived back in Berlin on Sunday night around 9:00pm. This past weekend marks the transition of the professors. I (DeRooy) am headed home tomorrow (Tuesday). Plaisier and his wife are exploring parts of Germany for this week and are headed home this weekend. This leaves Prof. Nielsen here in Berlin with the students. 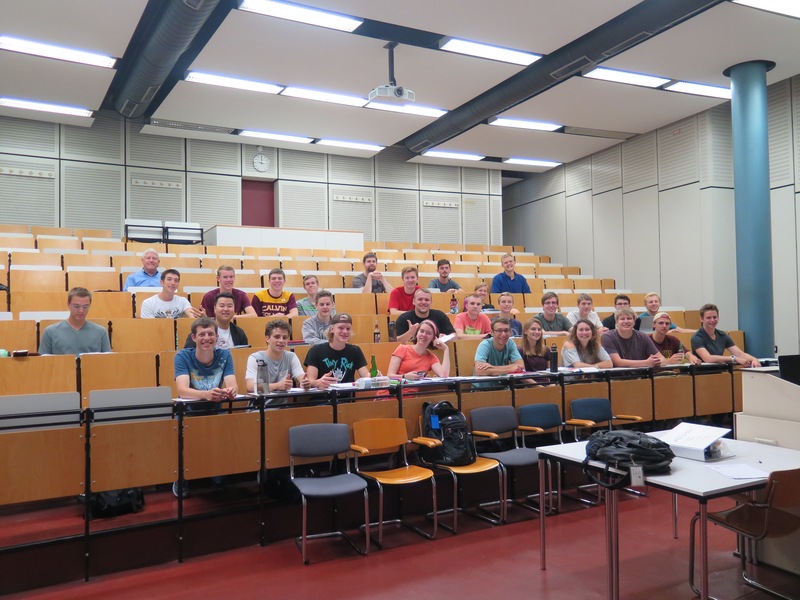 Today was their first lecture on Dynamics – the second half of the course. This is a friendly reminder that for a good portion of the day (and night) we are teaching/learning a 4sh Engineering course “Statics and Dynamics” (in English) and the students are also taking a German language and culture course from Professors affiliated with the TU Berlin. Our lectures are usually 3-4 hours long (with a coffee break somewhere in the middle). The students get anywhere from 5 to 11 homework problems that are due the next day. Most of the students work on their homework during the evening and the profs try to be available to help answer questions on the homework. Tomorrow (Thursday) they have test #2 in the engineering course. Here is an update on our student that is in the hospital here in Berlin. The doctors have diagnosed him as having ADET (Acute Disseminated Encephalomyelitis) so far his symptoms match and the treatment is working. The student’s mom and sister flew in from the USA to be with him. When they are not at the hospital, they are staying with us at St. Michael’s Heim. Prof. Nielsen arrived in Berlin today (as originally scheduled). This afternoon the three profs (De Rooy, Plaisier, Nielsen) went to visit the student. He is doing much better. He took a few walks down the hallway with the help of a walker. He spent some time outside with his mom including spending some time pushing his wheelchair. His sister says that he is starting to argue and tease her – which she is saying is a sign that he is getting better. He still has double vision and is cross-eyed, but the doctors have indicated that in time this will heal as well. At this time, we are waiting for the doctors to determine if and when he can fly back the the USA. We still have a prayer request: One of our students is sick and is in a hospital. We anticipate that he will be in the hospital for several days. His sister arrived from the USA today and his mom is traveling tonight and will arrive in Berlin tomorrow. Please pray that our LORD will give the doctors wisdom as they try to help the student get better. Please pray for the student and his family and friends that our LORD will provide peace and patience as we all wait for progress. One of our students has not been feeling well for the past several days. He is currently in the hospital here in Berlin for observation and tests. Please pray for this student and his family: That our LORD will comfort the student and give wisdom to the doctors so that they can determine what is wrong and how to treat the student. Pray for his family in the Chicago area as they patiently wait for answers from the doctors here in Berlin.